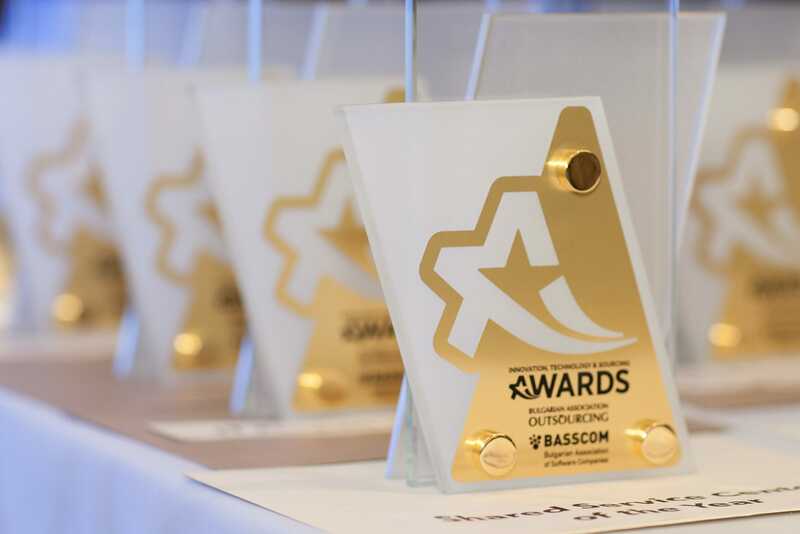 The awards for achievements in innovation, high technology and the outsourcing of the Bulgarian Outsourcing Association (BAA) and the Bulgarian Association of Software Companies (BASSCOM) were awarded for the third time at an official ceremony at the International Hotel in Varna. As technological city of the year, members of BAA and BASSCOM chose Burgas. In a contested race the Startup of the Year Award was won by Cargotec Bulgaria. The Finnish company, Cargotec established its first global business services center in Central and Eastern Europe in Sofia. The growth of activities in Bulgaria is impressive. The first 50 employees were recruited in August 2017, and today the number of company staff exceeds 200 highly qualified specialists. The award Innovation in Technology was granted to Programista for the Modern Money project, an application for blockchain trading, an innovative solution for personal finance. The same company seized the prestigious statuette in the category IT product of 2018. The company also impressed the jury with their product Style & Fit - a revolutionary solution for the fashion industry. It is used to create realistic 3D models of the human body in order to choose the correct size of clothing. All the user needs to do is send some photos and set their height and weight. Style & Fit generates a 3D model and recommends the ideal garment for the specific body type. The Board of Directors of BAA and BASCOM also chose the winner in the Technology Business Building category of the year. Almost unanimously the award was given to the newest modern business center in Sofia, Polygraphia Office Center. The IT Project of the Year Award was granted to Lirex. The company was commissioned to design and undertake the transformation of core infrastructure services meeting the highest requirements of aerospace, space and military organizations, according to the US Department of Defense. The project required the provision of an uninterrupted cycle of business operations and strict compliance with all policies, including the most stringent security rules. Bulgaria. The company impressed the jury with its Empower program. The purpose of the program is to ensure the provision of exceptional service to the customer, such as maintaining competitive prices in a rapidly changing and innovative environment. It has already been introduced in Bulgaria, Malaysia, Costa Rica, Chile, North America, EMEA, UK among many others. The award was presented by Tzvetomir Doskov from Sirma Business Consulting. Experian Bulgaria was apprised for being the Best Employer Company in the Sector of Technology for 2018. The award was achieved for the excellent management of people, which is the most important advantage of each corporation. Cargill won the award for Shared Services Center for 2018. The center was established in 2014 with the capacity for 15 people. Today, there are more than 1,000 professionals who manage Cargill's international business processes, communicating in more than 15 languages and offering a wide portfolio of high quality services including finance, transport and logistics, strategic supply and deliveries in Europe, the Middle East and Africa, as well as in the management of human resources. The award for the Outsourcing Services Provider in 2018 was received by Bulpros which has proved to be a company that offers added value to its clients, by realizing supreme practices and by supporting the sustainable growth of the entire outsourcing sector in Bulgaria. Michaela Lashova, Managing partner in Forton, part of AG Capital and strategic partner of Cushman & Wakefield in Bulgaria, awarded the Bulpros Chief Executive - Ivaylo Slavov. Forton was the Gold Sponsor of the annual outsourcing conference and the BAA and BASSCOM Awards. ScaleFocus was granted two gold statuettes. The company was announced to be the best R & D center due to their internal generator of ideas and an incubator for development. It consists of 5 teams presenting innovative ideas for solving health problems, climate change and social innovation. The second gold statuette they accepted for having the most innovative workplace of the year. Judges encouraged the fact that ScaleFocus built their own work environment design. The world's leading product and software development company, EPAM Systems, won the prize for Software company in 2018. Its main projects are related to different operations involving scientific research and development activities. The third award ceremony was held in Varna with the support of the mayor Ivan Portnih and his administration. More than 60 Bulgarian and foreign companies were competing for a variety of awards in the field of outsourcing, innovation and information technologies. "I want to thank the Bulgarian Outsourcing Association and BASSCOM for the excellent cooperation. Varna is a good place to live, a good place for developing business and investment. I believe that our seaside has potential prospects for high-tech development," said Mr. Portnih. He bestowed the Start Up of the Year award to Maya Milanova, managing director in Cargill, and granted her a plaque from Varna Municipality. "Today we start developing the idea of turning the seaside capital into a technological hub," explained Ivaylo Slavov, Chairman of the Bulgarian Outsourcing Association. "Part of the technology industry’s success in Bulgaria can be contributed to fact that you have sought growth outside of the capital. Together with our colleague Ivan Portnich, we will do our best to bring comfort, stability and even more success to you in the future" said the Mayor of Burgas Dimitar Nikolov upon receiving the Technological City of the Year Award. Last year the outsourcing conference took place in Burgas, and in 2019 the branch organizations will meet in Plovdiv, another big and fast-developing high-tech center. The outsourcing industry is one of the fastest growing sectors of the Bulgarian economy. Its annual growth is in the double-digits, and in 2017 its share contributed to 3.6% of GDP. "The industry is constantly changing. Today, it is much more about shared services, business processes in the human resources field, finance and buildings management that are being outsourced to outsourcing companies. There is growing interest in highly qualified work, especially in information technology services - software development, maintenance, system integration," explained Ivaylo Slavov, Chairman of the Bulgarian Outsourcing Association and CEO of Bulpros. "At a glance, there are no problems in the industry given that wages in the sector are four times higher than the country's average, and instead of complaining about unemployment, we are in constant search for qualified employees. We can help the Bulgarian economy to develop faster," BASSCOM chairman Dobroslav Dimitrov said. The credible jury choosing the winners includes Eric-Wilhelm Graf Behm, investment manager of the Gothenburg region, Sebastiano Tofeleti, Secretary General of the European Alliance of Digital SME Enterprises, Elinor Wynn, Outsourcing Expert, Marek Grodzinski, Regional Business Services Advisor in EY for Central and Southeastern Europe, Octavio Brito, responsible for regulations and IT control at Deutsche Bank, Peter Ivanov, entrepreneur and virtual teams expert, Victor Doctor, CEO of Pro Progressio Foundation, and Tim Cole, a bestselling author and journalist.